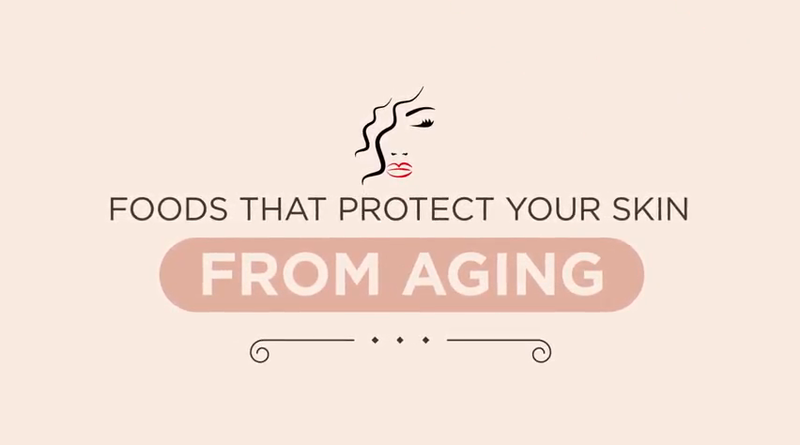 What Foods Protect Your Skin from Aging? Wearing sunscreen, using the right skincare products for your Baumann Skin Type®, and scheduling a cosmetic treatment or two are some of the best-known tips for combatting signs of skin aging. What many people may overlook, however, is how their diet affects their skin’s appearance. As the saying goes,”You are what you eat,” so it is important that you eat a healthy, balanced diet full of these anti-aging foods for younger-looking skin. Antioxidants play a key role in keeping your skin and body looking and feeling great. Things like UV light from the sun, air pollution, cigarette smoke, and eating fried foods can all cause free radicals to form within your body. Free radicals are molecules that have an uneven number of electrons. This makes them unstable and angry, so they steal electrons from other molecules around them, creating even more free radicals. This process, known as oxidative stress, is one of the leading causes of skin aging. Antioxidants, on the other hand, do not mind giving up an electron to neutralize these unstable free radicals. Once a free radical gets its missing electron, it settles down and no longer needs to take electrons away from other molecules. However, so many free radicals are created due to sun exposure, air pollution, poor diet, and other environmental causes, that the amount of antioxidants the human body can produce on its own just isn’t enough. This is why getting plenty of antioxidants through our diets and the products we apply directly to our skin is so crucial. Many colorful fruits such as blueberries, pomegranates, raspberries, cherries, and citrus fruits are rich in antioxidants, so try to eat all the colors of the rainbow. You can also drink green tea, red wine, coffee, and pomegranate juice to give your skin a boost of antioxidants. Mushrooms have been getting a lot of attention lately for their “super powers” when it comes to improving your health and staving off signs of skin aging. One big benefit is that many mushroom species have strong antioxidant and anti-inflammatory properties, both of which are important for protecting your skin from aging. Research also suggests that eating mushrooms could help to prevent and possibly even treat many forms of cancer. Mushrooms have the added benefit of being high in Vitamin D.
In addition to eating more mushrooms, you can also find them in a variety of skin care products. Your mother might have told you to eat carrots to protect your vision, but that’s not the only benefit of this common vegetable. Carrots are rich in vitamin A, a type of retinoid. Retinoids help to fight signs of aging by turning on the cells that produce collagen proteins and turning off the cells that produce enzymes like collagenese, which breaks down collagen. Since collagen is the protein that gives your skin its firm, youthful structure, the more collagen your skin as, the smoother and younger it will look. Retinoids are used topically to make skin look younger, however, you cannot crush up carrots and apply them to the skin and have the same benefit as a topical retinoid. It is much better to get the benefits of carrots in your diet. Other foods that are rich in vitamin A are liver, sweet potatoes, kale, and spinach. Fatty fish like salmon, tilapia, and cod contain high amounts of omega-3 fatty acids, a type of essential fatty acid. This means that our bodies cannot produce these fatty acids on their own, so we need to get them from the foods we eat. If you’re a vegetarian or vegan and do not eat fish, you can get omega-3s from flax seeds or flax seed oil. One benefit of certain types of fatty acids for your skin is that they can help to prevent transepidermal water loss (TEWL), which is especially a concern for people with dry skin. Omega-3 fatty acids are also anti-inflammatory substances, so they may help to reduce symptoms of chronic skin conditions such as eczema and rosacea. If you’re not much of a vegetable person, try to at least stock up on broccoli. This veggie contains high amounts of many different nutrients, including selenium, potassium, and vitamins A, K, and C.
Vitamin K has been shown to speed up your skin’s wound-healing process, as well as reduce bruising, while vitamin C is a powerful antioxidant and plays a role in collagen production. Many people want to know what foods they should avoid to improve their skin. The number-one item to scratch off your list if you want better skin is sugar. Most Americans are eating well over the recommended daily limit of sugar, which comes along with a whole host of health and skin problems. Most notably, sugar triggers a natural chemical process called glycation, in which sugar molecules attach to proteins like the collagen and elastin in your skin. This speeds up the aging process and causes lines, wrinkles, and sagging skin to show up on your face more quickly. Still have questions about the best anti-aging foods for your skin?–share your questions with us on our Facebook page or follow us on Instagram to learn the latest about skin science.